Ansamitocin P-3 (AP-3), produced by Actinosynnema pretiosum, has extraordinary antitumor activity and has been used as toxic “warhead” in antibody-conjugated drugs. However, AP-3 production is limited by its low yield and thus the high cost of fermentation. In this study, we aimed to reduce fermentation costs by utilizing the low-cost substrates and improve the AP-3 production, simultaneously. In this study, low-cost substrates used for ansamitocins production were selected via single-factor experiments and then the concentrations of these suitable carbon and nitrogen sources were optimized by response surface method (RSM). Cane molasses, glycerol, and cold-pressed soybean powder were determined to be the most suitable economical carbon and nitrogen sources for AP-3 accumulation. The AP-3 titer in shaking flasks reached 111.9 mg/L using the optimized medium containing cane molasses (63.22 g/L), glycerol (22.91 g/L), and cold-pressed soybean powder (3.29 g/L). In addition, appropriate supplementation with isobutanol, soybean oil, and vitamin B1 resulted in a marked enhancement in AP-3 production, to 141 mg/L. Meanwhile, the cost of this optimized fermentation medium was around 50% lower than those of two other high-yielding media. Our findings provided practical and economically competitive cultivation conditions for the production of a value-added antitumor agent and may thus extend the applications of ansamitocin P-3. 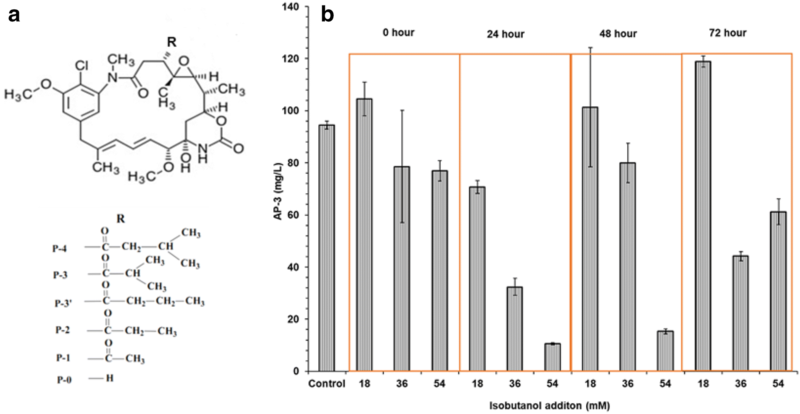 Ansamitocins, a group of maytansinoid antibiotics originally isolated from plants in Africa, can be synthesized by Actinosynnema pretiosum subsp. auranticum ATCC 31565 (Tanida et al. 1979). Maytansinoids exhibit strong cytotoxic activity by blocking the assembly of tubulin into functional microtubules (Trail et al. 2018) and thus have been used as a toxic “warhead” in antitumor drugs, such as trastuzumab emtansine (Kadcyla), an FDA-approved antibody drug for breast cancer. To reduce drug prices and meet commercial demand, improvements in AP-3 production and less expensive bioprocesses are urgently desired. Owing to its high commercial value, recent studies have focused on enhancing AP-3 production by medium optimization and genetic modification. 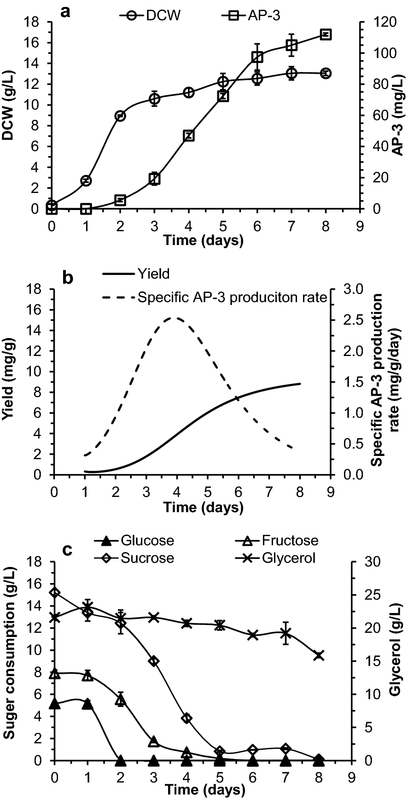 In terms of medium optimization, the highest AP-3 yield from A. pretiosum is currently achieved with relatively expensive ingredients, including fructose, sucrose, and glucose as carbon sources and yeast extract (YE) as nitrogen source (Fan et al. 2014; Du et al. 2017; Ning et al. 2017). The industrial use of YE as a high-cost nitrogen source further limits its industrialization. Thus, the use of inexpensive carbon and nitrogen sources is important for its industrialization and medical applications, and the commercial success of AP-3 requires an alternative non-food feedstock (Zhang et al. 2016a). In previous studies, AP-3 fermentation was promoted by the use of fructose and a mixture of various carbon substrates (Bandi et al. 2005; Fan et al. 2014; Du et al. 2017). To this end, inulin, a fructose oligomer linked by linear β-(2-1) bonds and derived from Jerusalem artichoke, dahlia tubers, and other plants, has been used as a feedstock for lipid, ethanol, and lactic acid fermentation and was assumed to be suitable for AP-3 production (Zhao et al. 2011; Wang et al. 2015). Cane molasses, a byproduct of sugar refineries, has been considered as another low-cost carbon source for AP-3 production. Cane molasses was constituted by approximately 40% of sugars, including sucrose, glucose, and fructose (Feng et al. 2011; Sharma et al. 2016), all of which were reportedly beneficial for AP-3 production. Cane molasses has been utilized extensively as carbon source in bulk biochemical production (Wang et al. 2000; Liu et al. 2008; Jiang et al. 2009; Srivastava et al. 2015), but has never been used as a carbon substrate for the production of antibiotics. Two continual goals are to reduce the fermentation cost and improve the production of AP-3. These two goals were fully achieved by economical substrate screening and medium optimization. In particular, the Box–Behnken design was utilized to evaluate the effects of cane molasses, glycerol, and soybean powder as low-cost substrates on AP-3 production. Cane molasses with a total sugar content of 46% and 80% brix was purchased from Guangxi and Jinqianwan Cane Molasses Co., Ltd. (Liuzhou, China). Inulin purchased from Tianhe New Hisense Co. (Guangzhou, China) was water washed to remove field dirt. Then, it was air dried and milled using a beater pulverizer to pass through 10-mm apertures in diameter. Soybean oil, cold-pressed soybean powder, hot-pressed soybean powder, peanut powder, and fish powder were gifted by China Meheco Topfond Pharma Co., Ltd. (Zhumadian, China). All other chemicals were of analytical grade and commercially available. Actinosynnema pretiosum ATCC 31565 was used in this study. The strain was stored in 2 mL aliquot vials and maintained at − 40 °C freezer in the seed medium containing 30% (w/w) glycerol. The culture media used in this study included: (M1): Seed culture medium consisted of (g/L) glucose, 10; yeast extract, 5; peptone, 10; glycerol, 10 and pH 7.4. (M2): Fermentation medium used for screening of low-cost organic nitrogen sources consisted of (g/L) fructose, 9.37; glycerol, 26.78; nitrogen sources, 10; MgSO4·7H2O, 0.5; FeSO4·7H2O, 0.01; KH2PO4, 0.25; NH4Cl, 1; and CaCO3, 5 at pH 7.4. (M3): Fermentation medium used for screening economic carbon sources (g/L): low-cost carbon sources, 30; YE, 10; MgSO4·7H2O, 0.5; FeSO4·7H2O, 0.01; KH2PO4, 0.25; NH4Cl, 1; and CaCO3, 5 at pH 7.4. (M4): Fermentation medium used to test the effect of glycerol on AP-3 production contained (g/L) low-cost carbon sources, 30; Glycerol, 10; YE, 10; MgSO4·7H2O, 0.5; FeSO4·7H2O, 0.01; KH2PO4, 0.25; NH4Cl, 1; and CaCO3, 5 at pH 7.4. (M5): The basal composition of fermentation medium used for optimization by RSM (g/L): MgSO4·7H2O, 0.5; FeSO4·7H2O, 0.01; KH2PO4, 0.25; NH4Cl, 1; and CaCO3, 5 at pH 7.4. Appropriate amounts of the carbon and nitrogen sources were to be optimized in this study. A single colony of A. pretiosum was picked out into 50 mL of seed medium in a 250 mL flask at 28 °C, 220 rpm for 48 h pre-culture. 0.5 mL of the pre-culture cells was transferred into another fresh seed medium for further 24 h. The A. pretiosum seed culture was inoculated into the fermentation medium at the volume ratio of 1%. Fermentations were run at 28 °C on a rotary shaker at 220 rpm and 50 mL loading in 250 mL-Erlenmeyer flasks for 8 days (Fan et al. 2014). All fermentation experiments were carried out in duplicate. Samples were withdrawn at regular intervals for analysis. The precipitate of two milliliters fermentation culture was washed twice with 0.1 M HCl to remove the residual CaCO3. The residual cells were then dried to constant weight at 105 °C to gain dry cell weight (DCW). For AP-3 extraction, 1 mL of supernatant was extracted with equal volume of ethyl acetate for 3 times. The samples were centrifuged at 12,000 rpm for 5 min and the supernatant ethyl acetate was collected. The AP-3 extracts were subsequently evaporated to dry and dissolved with 1 mL of methanol. Then, AP-3 was assayed at 254 nm by Shimazu LC-20AD and UV/Vis detector SPD-20A (Kyoto, Japan) with SinoChrom ODS-BP column (4.6 * 250 mm, 5 μm) at 30 °C. 85% methanol and 15% water were used as the mobile phase at a flow rate of 0.6 mL/min. Fructose, glucose, sucrose, and glycerol contained in the taken samples were analyzed using Shimazu LC-20AD HPLC system (Shimadzu Corporation, Tokyo, Japan) and refractive index detector RID-10A with a Bio-Rad Aminex HPX-87H column at 65 °C. 5 mM H2SO4 in water was used as the mobile phase at a flow rate of 0.6 mL/min. All samples were filtered through a 0.22 μm filter before analysis. 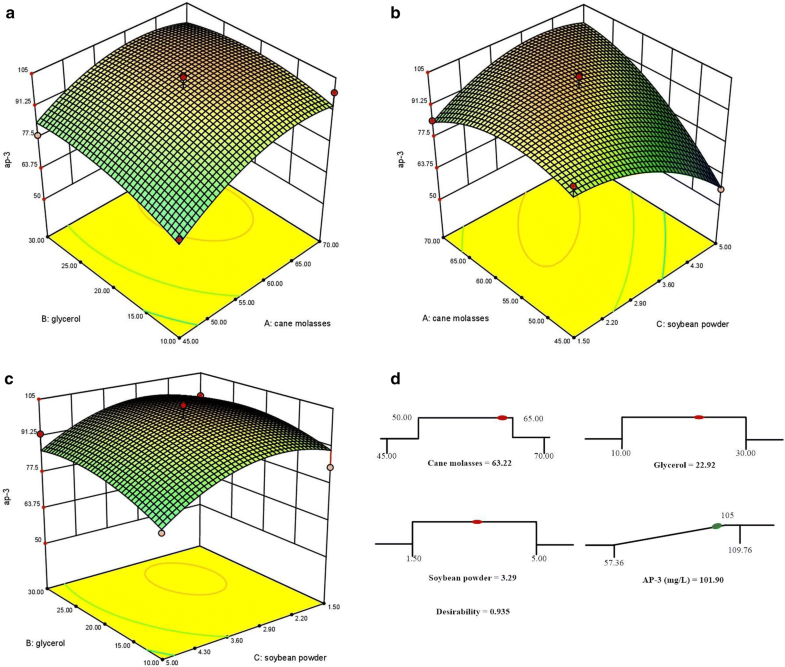 Response surface method based on Box–Behnken design was used to optimize appropriate medium composition for maximum AP-3 production by A. pretiosum (Zhang et al. 2016b). Three medium components: cane molasses, glycerol, and soybean powder were studied at three levels: high (+), intermediate (0) and low (−). The experiments have been carried out at 17 trials with five replicates at the center point and the values of responses were the mean of two replicates. where Y is the predicted response, β0 is the intercept term, βi is the linear coefficient, βij is the quadratic coefficient, βii is the interaction coefficient, and XiXj represents the independent variables. Design expert version 8.0.6. (Stat-Ease Inc., Minneapolis, MN) was used for the experimental designs and subsequent analysis of the experimental data. The analysis of variance (ANOVA) was performed to inspect the response surface model. The fitted polynomial equation was then expressed in the form of three-dimensional response surface plots, to illustrate the relationship among the responses and the experimental levels of each independent variable (Wei et al. 2012). 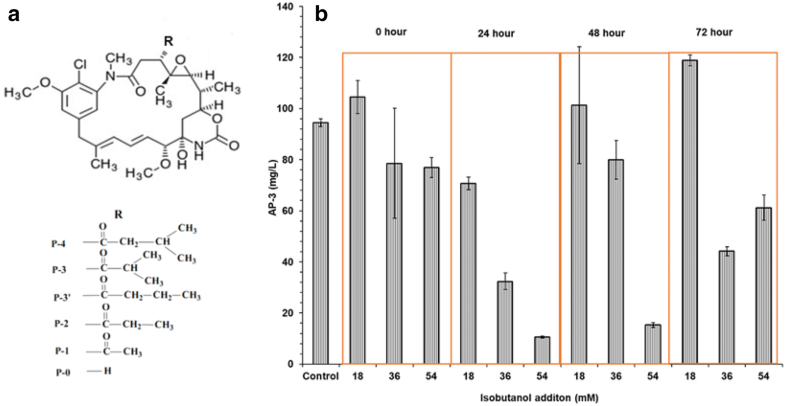 The use of fructose as a carbon source improves the production of secondary metabolites (Sã et al. 2010; Fan et al. 2014). However, the relatively high price of monosaccharides is not suitable for large-scale fermentation. The fructose oligomer inulin was assumed to be suitable for AP-3 production. Contrary to our expectation, as shown in Fig. 1a, the AP-3 titer was low, i.e., 5.4 mg/L, and cell growth was approximately 4.0 g/L when using inulin as the carbon source. After 8 days fermentation, about half of the initial 30 g/L inulin had been utilized directly without the hydrolysis step by A. pretiosum (data not shown). Previous studies have indicated that soybean oil could increase the production of several antibiotics, e.g., FK506, validamycin, and erythromycin (Hamedi et al. 2004; Wei et al. 2012; Wang et al. 2017). As shown in Fig. 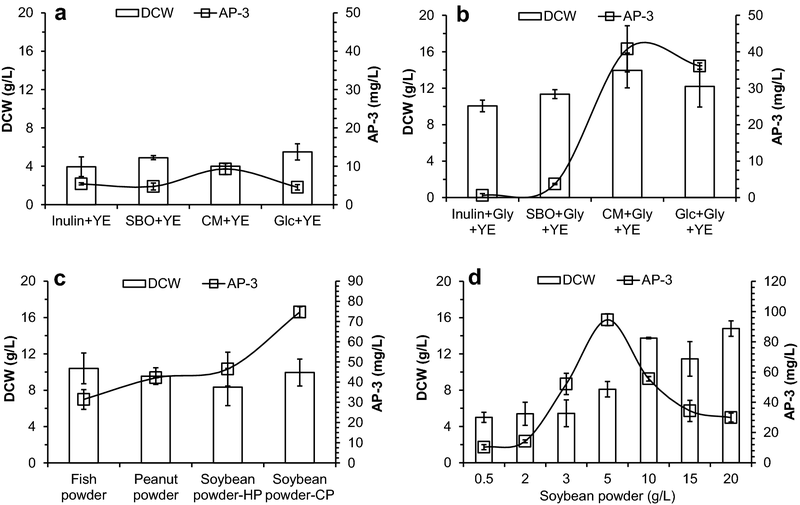 1a, soybean oil was fermented by A. pretiosum, producing 4.7 mg/L AP-3, and cell growth was improved over those of two other low-cost media, indicating that soybean oil may be useful for the economical production of AP-3. Cane molasses, a byproduct of sugar refineries, has been previously reported to contain 2% (w/v) nitrogen (Xu and Xu 2014). Initially, we used cane molasses without nitrogen for the fermentation of AP-3, where cells grew very well, but no AP-3 was detected (data not shown). After the addition of YE to cane molasses medium, as shown in Fig. 1a, 4.0 g/L DCW and 9.3 mg/L of AP-3 were achieved, suggesting that cane molasses is more suitable than inulin and soybean oil for AP-3 production and that the addition of an organic nitrogen source is necessary. Glycerol, a byproduct of biodiesel, has been suggested to be an effective carbon substrate for the AP-3 precursor methoxymalonyl–ACP (Wenzel et al. 2006) and was, therefore, chosen as an additional carbon source. As shown in Fig. 1b, cell growth increased markedly upon the addition of glycerol. In addition, AP-3 production was dramatically enhanced in both cane molasses–glycerol–YE medium (40.8 mg/L) and glucose–glycerol–YE medium (36.1 mg/L), with yields approximately four- and eightfold higher than those without glycerol. However, no increase in AP-3 production was observed upon addition of glycerol in inulin–YE or soybean oil–YE medium. Based on the above results, a combination of cane molasses and glycerol was considered as the best carbon source for medium optimization, in order to achieve better AP-3 production. Organic nitrogen sources are usually much more expensive than carbon sources. As an essential component of the culture medium (Ling et al. 2016), organic nitrogen sources are generally converted into various intermediates and may considerably affect secondary metabolite biosynthesis (Wei et al. 2012). In previous studies, a variety of organic nitrogen sources have been tested for poly(epsilon-l-lysine) and poly(l-diaminopropionic acid) production, but none of these studies yielded product concentrations as high as those obtained using the more expensive YE and beef extract (Xia et al. 2014). In this study, cheap organic nitrogen sources including hot- and cold-pressed soybean powder, peanut powder, and fish powder were evaluated. As shown in Fig. 1c, substantial cell growth was observed using all the organic nitrogen sources, with the best AP-3 production observed in medium containing cold-pressed soybean powder as the nitrogen source (74.7 mg/L). The contributions of various concentrations of cold-pressed soybean powder (hereafter referred to as soybean powder) to cell growth and AP-3 production were, therefore, investigated further. Cell growth and AP-3 production showed different responses to the increased nitrogen source concentration: cell growth increased with an increase in soybean powder concentration, while a favorable effect of limited nitrogen source on AP-3 production was observed. The highest concentration of AP-3 (94.6 mg/L) was obtained when the medium contained 5 g/L soybean powder, while excessive concentrations of soybean powder inhibited AP-3 biosynthesis (Fig. 1d). One probable explanation for these experimental results was that the accumulation of secondary metabolites was a response to environmental nutrient availability but uncoupled with cell growth (Sã et al. 2010). The Box–Behnken model, which provides excellent predictability within the spherical design space and requires fewer experiments compared to full factorial designs or central composite designs (Ferreira et al. 2007), is widely used in antibiotic fermentation to optimize medium components and other parameters (Arul et al. 2013). Several rounds of pre-experiments were carried out to position the simulated central area. Three medium components, i.e., cane molasses, glycerol, and soybean powder, were studied at three levels: high (+), intermediate (0), and low (−). Three-dimensional surface plots and a ramps view (Fig. 2) were generated to evaluate the interaction effects and optimal levels of the three tested components. Based on the numerical optimization, the quadratic model predicted that the maximum AP-3 yield was 101.9 mg/L, with optimal values of the test factors of 63.23 g/L cane molasses, 22.91 g/L glycerol, and 3.29 g/L soybean powder (Fig. 2d). AP-3 fermentation of A. pretiosum was carried out in the optimized medium to validate the statistical results. Cell growth, substrate consumption, and AP-3 production were measured, and results are shown in Fig. 3. The transition from exponential growth to the stationary phase occurred around day 3, with a final biomass of 13.1 g/L DCW (Fig. 3a). AP-3 accumulation began on the second day and increased throughout the fermentation period. The final experimental AP-3 titer and AP-3 yield were 111.9 mg/L and 8.5 mg/g, respectively, which was close to the predicted value (101.9 mg/L) in the statistical model (Fig. 3a). The specific AP-3 production rate in the optimized medium peaked to 2.5 mg/g/DCW day at 3.9 days. Cane molasses can be utilized directly by A. pretiosum cells, without the hydrolysis step used in previous studies (Liu et al. 2008; Xia et al. 2014). Assessment of the sugar composition showed that 63.22 g/L cane molasses contained 15.21 g/L sucrose, 7.92 g/L fructose, and 5.18 g/L glucose. The total sugar content of cane molasses was approximately 44.78% (w/w) and glucose was rapidly consumed within 2 days, and fructose and sucrose were consumed within 5 days, and only a small amount of sucrose (less than 1 g/L) remained at the end of fermentation. The consumption of glycerol was steady and slow; only 7.27 g/L glycerol was consumed throughout the fermentation process. An excess of glycerol may explain the continuous increase in AP-3 titer. In a previous study, 40 g/L glycerol supported continuous AP-3 production for up to 12 days of fermentation (Du et al. 2017). Ansamitocins are distinguished from each other by the type of acyl moiety at the C-3 position of the ansa chain (Fig. 4a) (Higashide et al. 1977). Among the derivatives, ansamitocin P-3 with an isobutyryl moiety at the C-3 position has the strongest antitumor activity (Kupchan et al. 1978); thus, we attempted to selectively accumulate AP-3 by the addition of isobutanol (Hatano et al. 1984). The timing of isobutanol addition (at 0, 24, 48, or 72 h) and the amount added (18, 36, or 54 mM) was explored (Fig. 4). Supplementation with 18 mM isobutanol increased AP-3 production, while higher concentrations of isobutanol had an inhibitory effect on AP-3 biosynthesis, presuming the high concentration of isobutanol caused damage to the cell. The optimal timing of isobutanol addition was 72 h after inoculation. In the presence of isobutanol, no obvious difference of cell growth was noticed, reached 12.7 g/L DCW after 8 days fermentation, while the final AP-3 titer, yield, and the maximal specific AP-3 production rate increased to 120.4 mg/L, 9.5 mg/g, and 2.6 mg/g/DCW day, respectively. Meanwhile, significant decreases in peak areas of AP-2 and AP-4 were observed with the isobutanol supplementation (Additional file 1: Fig. S1). It was reported that the concentration of cellular isobutyryl-CoA acyl donor of isobutyryl moiety for AP-3 was increased with isobutanol supplementation (Lin et al. 2011), thus resulting in the selective accumulation of AP-3. In this study, we used two different batches of cane molasses from different years, producing 111.9 mg/L and 108.9 mg/L AP-3 in the optimized medium and 120.4 mg/L and 127.1 mg/L AP-3 in isobutanol supplemented culture. The AP-3 production did not differ substantially in the two batches of cane molasses, demonstrating the feasibility and stability of cane molasses as the low-cost carbon source for AP-3 fermentation. Since it was reported that small amounts of soybean oil and vitamin B1 could increase antibiotic production, these two components were added appropriately to the optimized medium. Table 4 shows that the supplementation of 4 g/L soybean oil and 200 mg/L vitamin B1 led to a final AP-3 titer of 141.4 mg/L, which is approximately 17% higher than that achieved upon isobutanol supplementation alone. The total costs of the carbon and organic nitrogen sources for the medium used in this study and two other high-yielding media were estimated, as shown in Table 5. By utilizing economical substrates, the fermentation costs associated with AP-3 production could be reduced by 50%. Compared to the medium used in other studies, the optimized medium developed in this study (containing cane molasses, glycerol, and soybean powder) was more cost-effective, achieving high AP-3 production with less expensive fermentation medium. Cost efficiency is always a key factor for the industrialization of products. The use of inexpensive raw materials, instead of monosaccharides and YE, is important for the economical production of ansamitocin P-3. In this study, an optimal culture medium containing cane molasses, glycerol, and soybean powder was developed via statistical methods, resulting in a 12-fold increase in AP-3 production. Subsequently, more efforts were conducted to increase the proportions of ansamitocin P-3 and the production of AP-3 by A. pretiosum was successfully enhanced to 141 mg/L at the shaking flask level with 50% reduction of associated costs. Therefore, this study provides a cost-effective method for the microbial production of AP-3. QH developed and designed this study. TL and LB performed the experiments. TL drafted the manuscript. JC and L-JW assisted in the research experiments. All authors read and approved the final manuscript. This study was partly financially supported by National Natural Science Foundation of China (21776081, 21576089). 40643_2018_235_MOESM1_ESM.docx Additional file 1. Additional Table S1 and Figure S1.